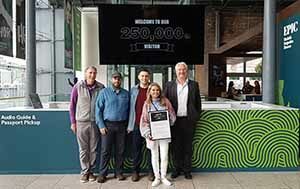 You are at:Home»Ireland inbound»EPIC Emigration Museum receives its 250,000th visitor. It was Dana’s first visit to Ireland from the USA. She is visiting with her husband Avery, son Tarin and family friend Gabriel. Dana only recently discovered that she has Irish ancestry and is finding out more about these connections with the team at the Irish Family History Centre.